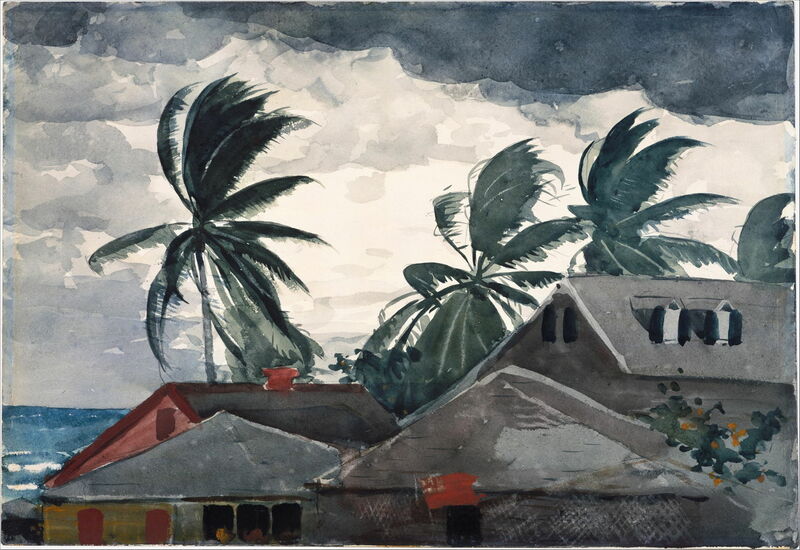 Winslow Homer (1836–1910), Hurricane, Bahamas (1898), watercolor and graphite on wove paper, 36.7 × 53.5 cm, The Metropolitan Museum of Art, New York, NY. Wikimedia Commons. One not uncommon English phrase to express futility and difficulty is to say that it’s like painting the wind. As we are now at that time of year when the wind tends to blow strongest, I thought it might be interesting to examine the evidence for that figure of speech. Is it like painting the wind? 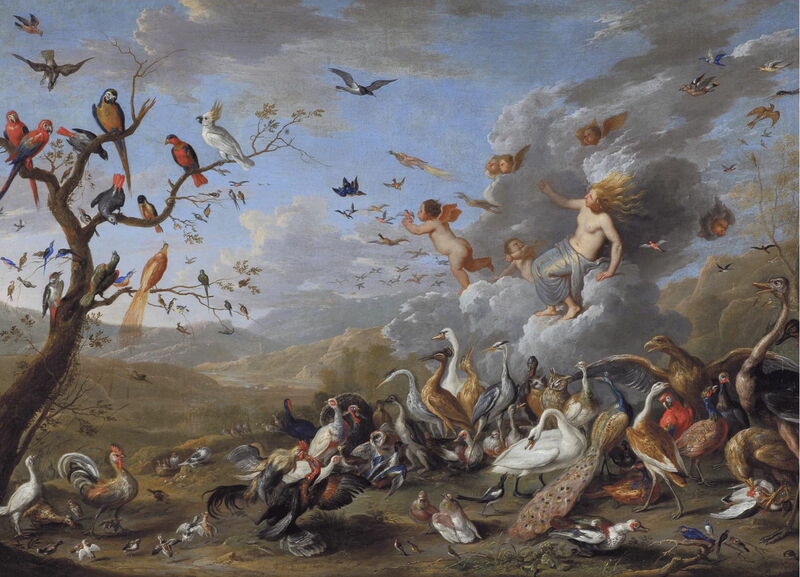 Jan van Kessel the Elder (1626–1679), Allegory of Air (1661), oil on canvas, 60 × 84 cm, location not known. Wikimedia Commons. Although Renaissance and later painters largely accepted that it was preferable to depict wind in figurative form, as Jan van Kessel the Elder did in his spectacular Allegory of Air (1661), as landscape painting became established as a genre, its exponents tried to do better. The great early landscape masters such as Poussin seem to have felt constrained by the sensitivity of their patrons not to overdo the forces of nature – although they did paint some cracking thunderstorms on occasion. But for wind, distant trees swayed a bit, the occasional branch broke off, and lakes became ruffled. There was nothing to make you hold onto your hat as you stood gazing at their beautiful, idealised landscapes. Thomas Gainsborough (1727–1788), Landscape with Cottage and Church (1771-72), oil on canvas with some black chalk, 61.6 x 69.2, Yale Center for British Art, New Haven, CT. Wikimedia Commons. It seems to have been the following generations of landscape painters who really started to show wind at its most obvious. 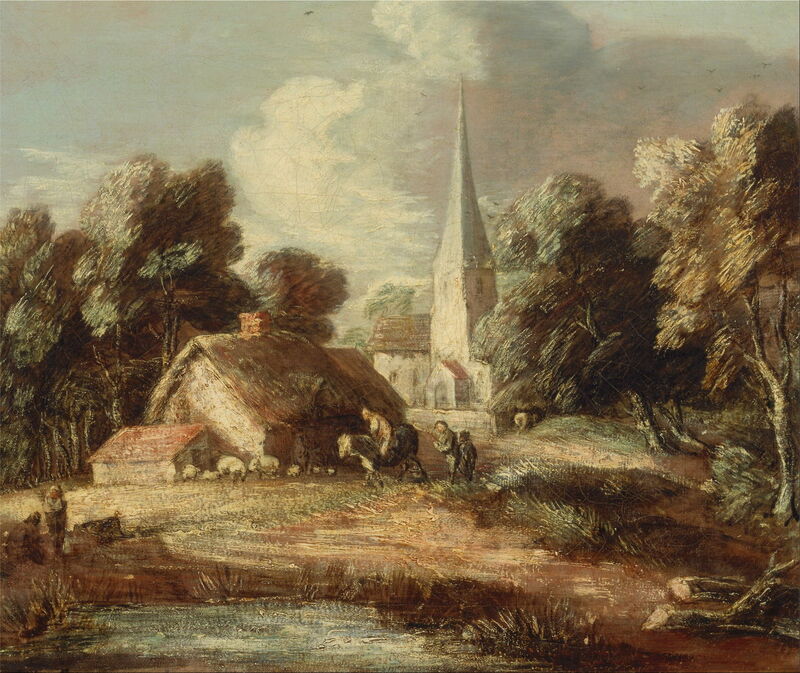 Thomas Gainsborough’s quite sketchy Landscape with Cottage and Church (1771-72) is one of the first works to use angled highlights over the foliage of trees to make them look as if they are moving in the wind, and its style was far ahead of its time. 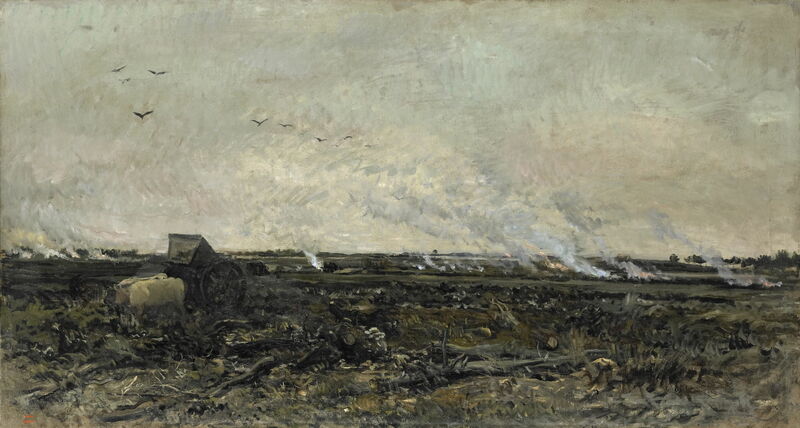 Although trees are a help when depicting wind, Daubigny’s undated October manages very well with the tell-tale smoke rising from burning stubble. 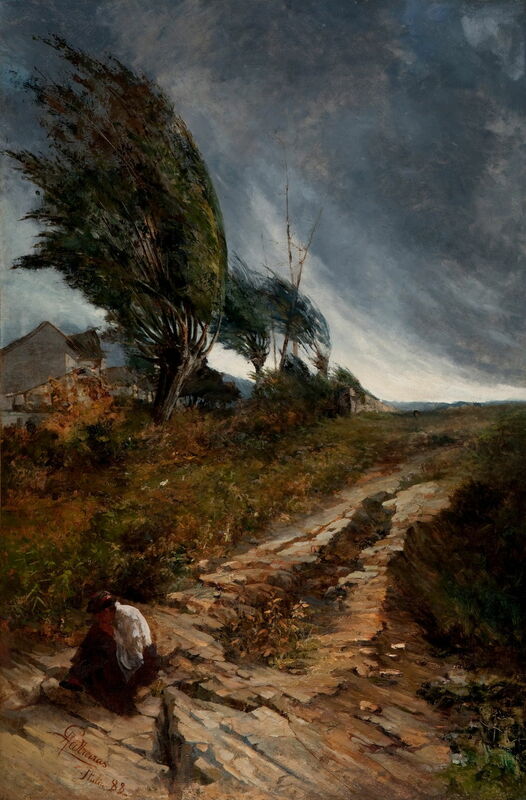 Gustave Courbet (1819–1877), The Gust of Wind (c 1865), oil on canvas, 146.7 × 230.8 cm, Museum of Fine Arts, Houston, TX. Wikimedia Commons. 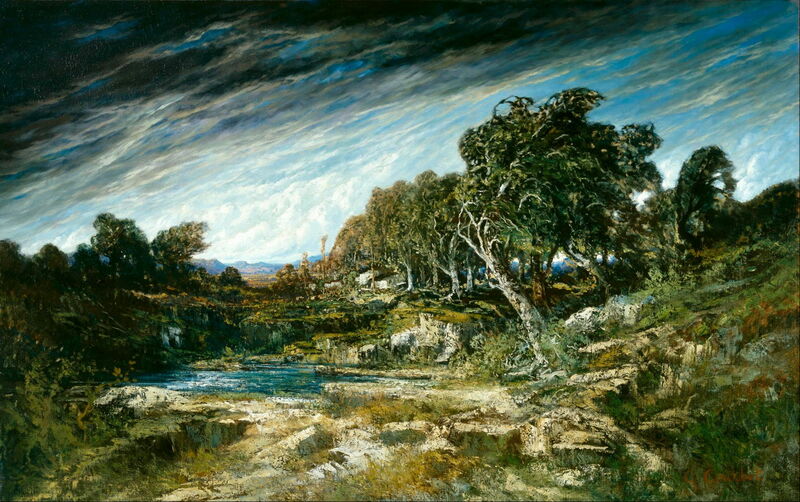 Gustave Courbet shows how a ‘leaning’ sky can amplify the windswept branches, in The Gust of Wind (c 1865). Jean-François Millet seems to have perfected the formula for severe storm conditions on land in The Gust of Wind (1871-73). The single tree has been torn limb from limb, with some of its branches being blown to the right, and is now being uprooted. A man is silhouetted in a streamlined position, trying to shield himself from debris. Even the sky echoes the horizontally-drawn branches. 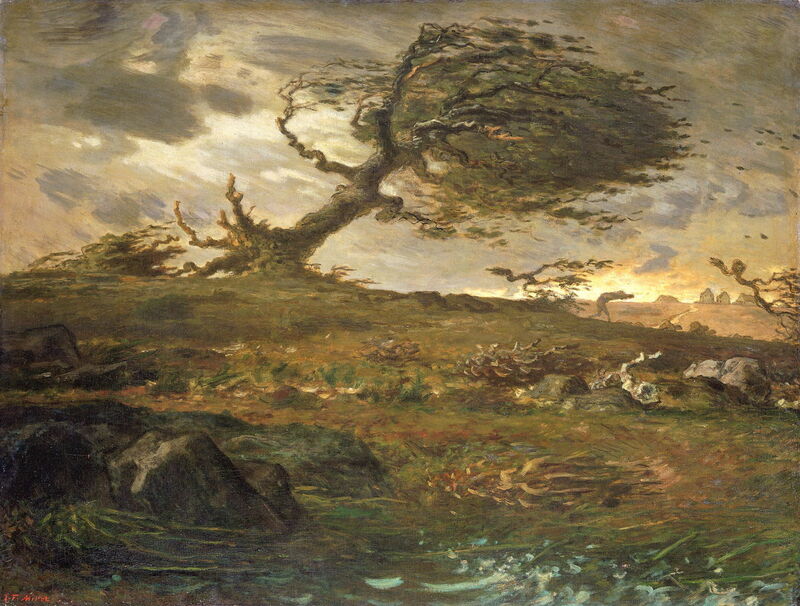 Antônio Parreiras (1860–1937), Ventania (The Windstorm) (1888), oil on canvas, 150 × 100 cm, Pinacoteca do Estado de São Paulo, São Paulo, Brazil. Wikimedia Commons. 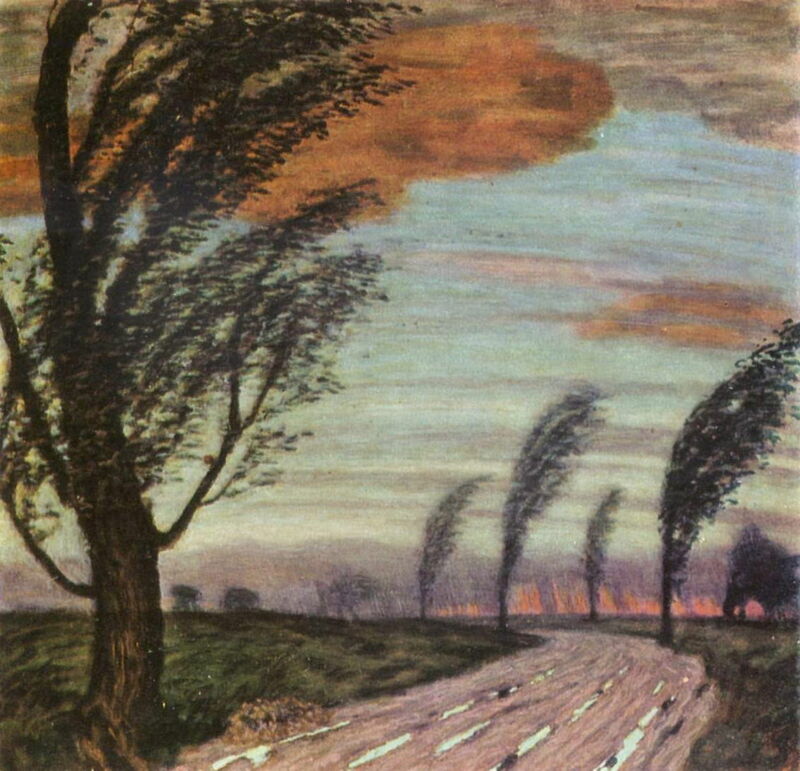 Antônio Parreiras’ wonderful Ventania (The Windstorm) (1888) is not as extreme, but just as eloquent – again using a leaning sky to accentuate the arcs formed by the trees. Claude Monet (1840–1926), Poplars (Wind Effect) (1891), oil on canvas, 100 × 73.5 cm, Private collection. Wikimedia Commons. With the Impressionist emphasis on transient effects of light, rather than weather, their paintings tend to be more subtle again. 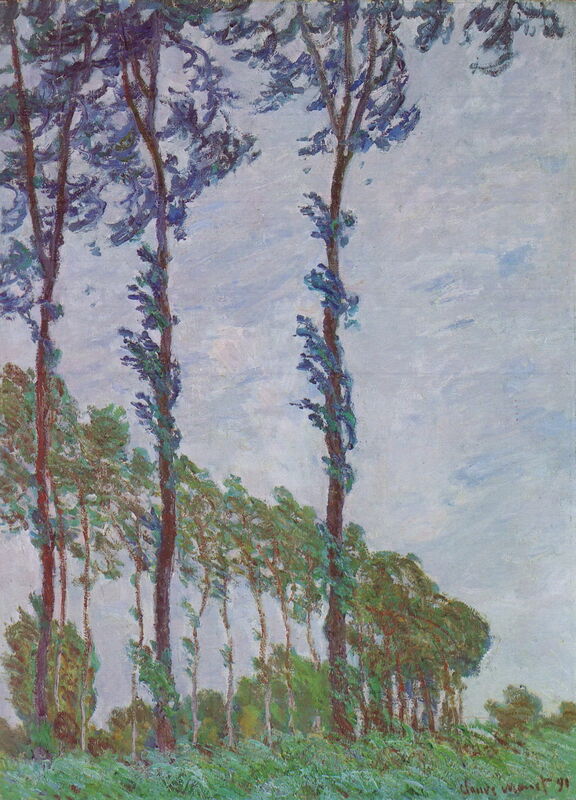 Renoir’s treatment of wind (in his Gust of Wind from about 1872) is understated, and Claude Monet’s Poplars (Wind Effect) (1891), shown above, is also gentle. Gustave Caillebotte, Laundry Drying, Petit Gennevilliers (1892), oil on canvas, 106 x 151 cm, Wallraf-Richartz-Museum. WikiArt. Some of the most effective aids for the depiction of wind are flags and drying washing. While Sisley used the former, Gustave Caillebotte painted two views in which a washing line gives the strongest clue as to the wind. 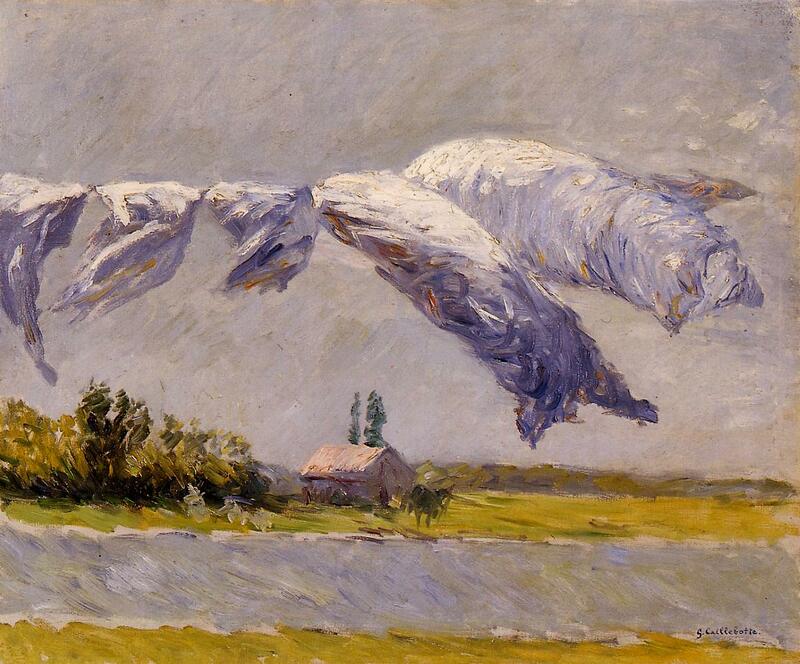 This is his Laundry Drying, Petit Gennevilliers (1892), the windier of the two scenes. Following his time at Cullercoats in England painting fisherfolk there (which I will consider in the next article), Winslow Homer’s simple and effective watercolour of Hurricane, Bahamas (1898) should come as no surprise. Franz von Stuck (1863–1928), Storm Landscape (c 1920), oil on panel, 60 × 62.5 cm, Private collection. Wikimedia Commons. Although not famous as a landscape painter, Franz von Stuck’s Storm Landscape (c 1920) leaves the viewer in no doubt. None of those paintings gives much of a clue as to how cold the wind felt. 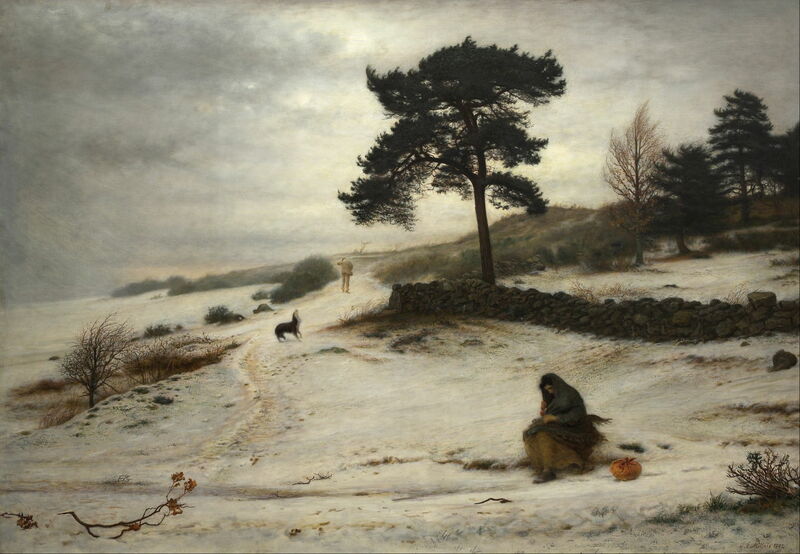 The British painter John Everett Millais’ Blow Blow Thou Winter Wind (1892) is one of the bleakest images that I know, which is clearly not only windy, but icy cold too. The trees contribute little to the effect, indeed its profound bleakness is made the stronger by their absence. The effects of the wind are also shown quite sparingly: as with Poussin, they are subtle signs such as the distant man holding his hat, and the blown clothing of the woman in the foreground. Gales and high winds have most commonly been shown on the coast, and at sea, for which there is a great wealth of fine examples. I will show here a small selection, noting that almost every painting of a sailing boat or ship under way inevitably depicts the wind as it fills sails. 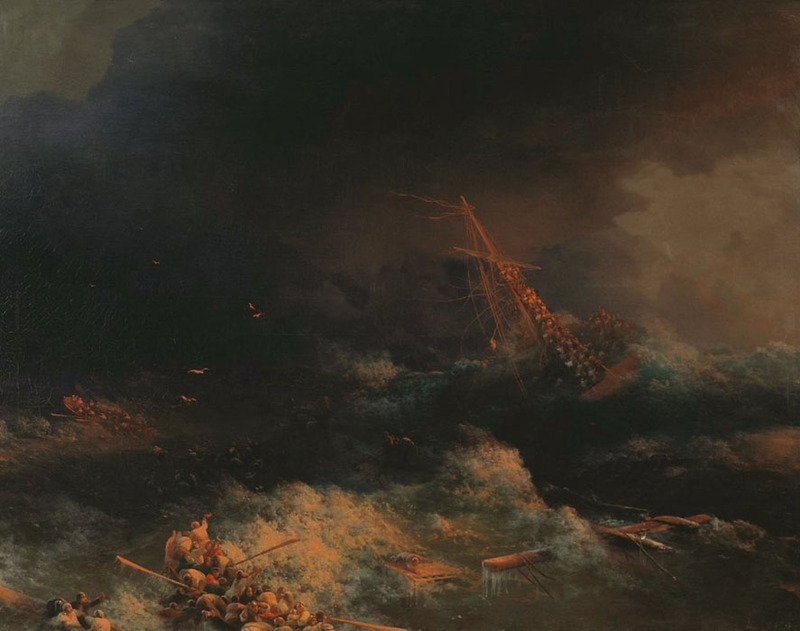 Paintings of shipwrecks are also quite common, and almost invariably show a storm with high winds. 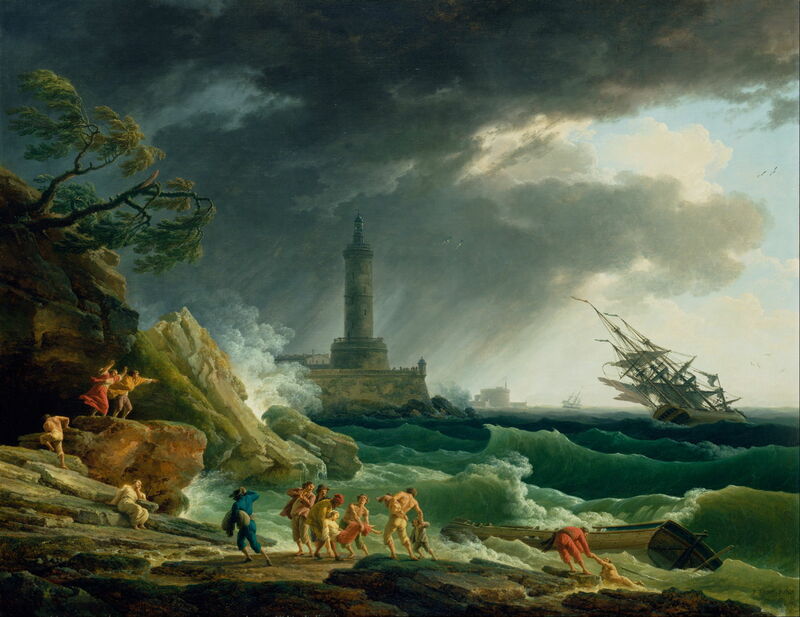 Claude Joseph Vernet’s A Storm on a Mediterranean Coast (1767) is quite a good earlier example of shipwreck and storm on the coast, and uses the small clump of trees at the upper left to good effect, as well as clouds of spume and spray. JMW Turner was one of the great masters of the shipwreck/storm maritime scene. My favourite example is this Snow Storm, Steam Boat off a Harbour’s Mouth (1842). 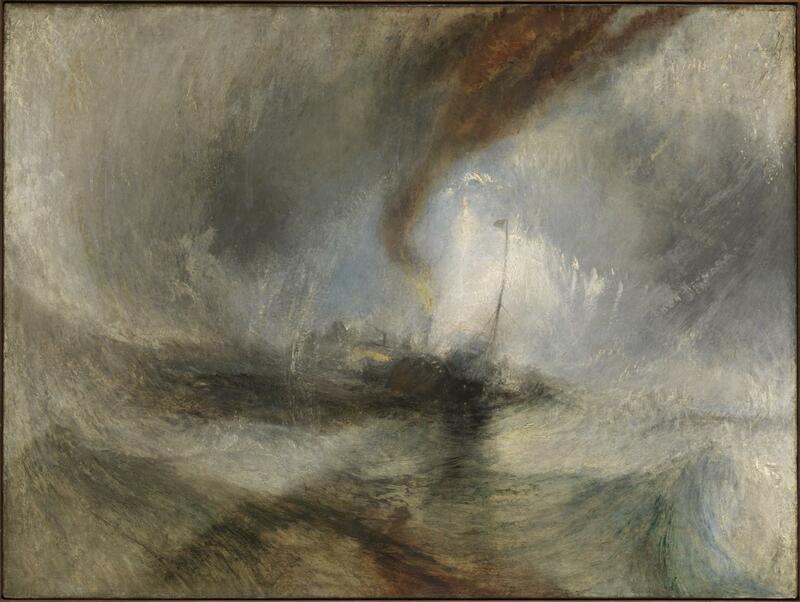 This was the work for which it was claimed that Turner had himself lashed to the mast so that he could observe the storm properly – almost certainly false and quite unnecessary anyway. As a seasoned Channel traveller, Turner would have had ample previous experience. This painting also shows one of Turner’s most distinctive features in painting storms: unlike Millet’s horizontal streamlines, Turner shows a vortex, with his subject seen in its central eye. Although not exactly natural, it has proved very atmospheric. 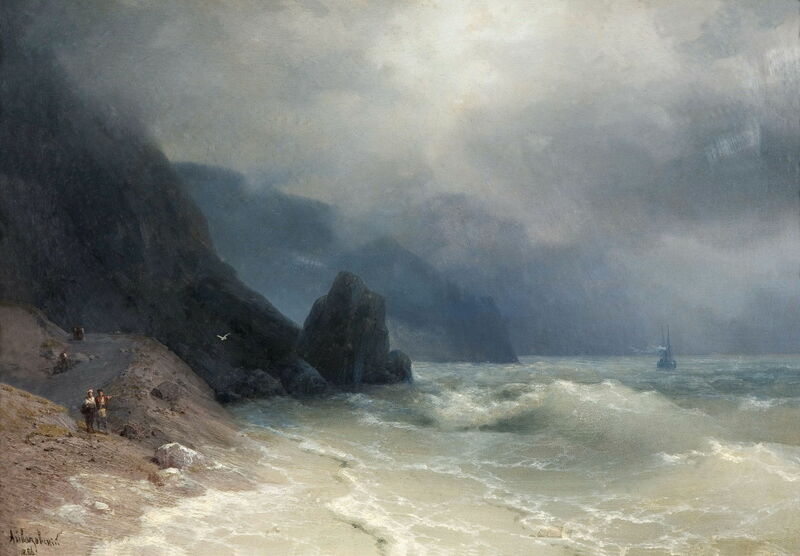 The undoubted master of dramatic maritime painting in the latter half of the eighteenth century was Ivan or Hovhannes Aivazovsky (1817–1900). His lifelong fascination with the sea concentrated more on waves than the movement of air. However, this view of a Sea Coast from 1886 is superbly realistic. His paintings of shipwrecks, such as his Loss of the Ship “Ingermanland” in the Skagerrak on the Night of 30 August, 1842 (1876) are also masterly studies in depicting the wind. Looking at landscapes and seascapes, it seems to me that painting the wind – although not easy – can be very effective. The next and final article looks at how this is helped by the introduction of figures. Posted in General, Painting and tagged Aivazovsky, Caillebotte, Courbet, Daubigny, Gainsborough, Homer, landscape, Millais, Millet, Monet, painting, storm, Turner, Vernet, von Stuck, Wind. Bookmark the permalink.